They should have a little bee that raps about this cereal on commercials. 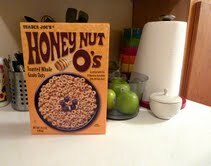 "Honey Nut O's, mine not yo's..."
But I guess that would kinda be copying the Cheerios bee. Not that the Cheerios bee raps...only because "Honey Nut" doesn't rhyme with "Cheerios." If it did, I'm sure the Cheerios bee would bust it out like Jay-Z...Hey, they could call him "Jay-Bee." Get it? Since they're made of oats, they could have a rapping horse...since horses like oats I think. And they could name it after some famous horse...Mr. Ed...Secretariat...Seabiscuit...I guess they could call him Honeybiscuit. Anyway, I like this cereal. It's very close to the Honey Nut Cheerios in terms of flavor and texture, and it's generally cheaper. Good Stuff. Sonia and I give it Four and a half Stars a piece. Bottom line: 9 out of 10.